Sometimes big companies or some people need to find the designated email addresses of websites for their use and when they try to find, there is no email address available on the website. To solve that issue, an extension called email finder is available. Email finder lets the user find email addresses from Linkedin profiles or websites. You may also wonder whether that email address is valid or not so as to be safe from scams or fraudulent activities. Email finder comes to the rescue in this case as well as it lets you validate the email address of your choice with email verifier and the message with email sender. Snovio is one such example of a handy email addresses search tool. It helps you perform all the tasks of the email finder as it comes with an inbuilt email verifier, email drip campaigns and a lot of free tools for the users to access. If you add the Snovio extension to your chrome browser, it will help you find your prospective leads’ email, then put them into mailing lists so that you can get replies and nurture the leads automatically without any troubles. Sale managers can do better and improved prospecting finding more email addresses and sending triggered email sequences. Whereas the marketers on the hand can scout and research bloggers, website owners or journalists and contact then in a few clicks without having to go through the long way. Also Checkout Price Optimization Software: What Exactly It Is? You can spare your precious time by saving the email addresses and prospects from some of the most popular professional networks, google search or any website you need using Snovio tool. If you wish to check email addresses instantly and do not want to be charged for it, snovio is your go-to tool. Along with it, the email verification feature will make your bulk email lists bounce free. You can send email drip campaigns from the application panel of the tool with a handy yet powerful drag-and-drop editing feature. 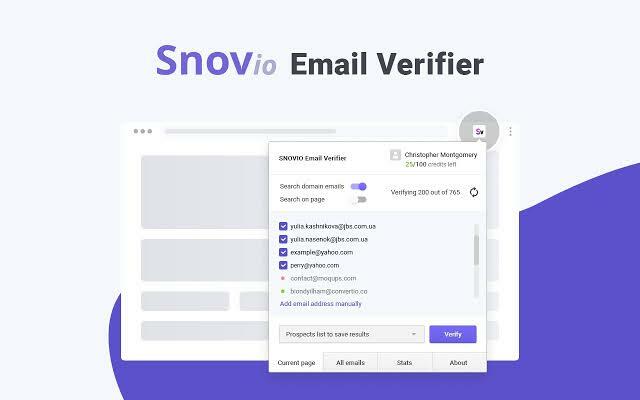 Snovio email finder tool also provides the users with a Boolean-string search queries generator for Google, Linkedin, Github, Facebook, and many others. Besides the email addresses, the snovio tool provides the users with other structured information which helps in enhancing your data so the users can target specific position within the company of their choice. Email tracker feature for Gmail- When you have sent an email and you are in thoughts about what happens after you have sent it, this 100% free and unlimited Gmail email tracker extension will let you know if the receiver has opened your email. You will also receive real-time notifications on your browser whenever the receiver opens your email or clicks on any link mentioned in the email. Technology checker- Another great feature that comes with this tool is identifying your competitors with technology checking feature. This feature helps you scout websites by the stack of technologies those websites use or check what technology is utilized on specific websites. You can check what CMS, web frameworks, software. Analystics, marketing and ecommerce tools are uses by various businesses and your competitors. This will help you stay updated and stay toe-to-toe with your competitors. Just like email tracker feature, this feature is also free of cost and no charges need to be paid to use this feature. The best feature of having the Snovio tool is that it does not interfere or interrupt other email addresses finding chrome extensions including some of the popular names like clearbit, rocketsearch, hunter.io, scrapp and instead it works alongside them. You got to add an email account and design triggered email sequences to follow up your prospects, save templates, and send emails of the contracts that have been find from the web application to lists. The aforementioned article discusses about a great email finding tool called Snovio plugin tool. It helps you find email addresses from various websites along with features like verification of the email by checking the message and the sender. It has been designed keeping in mind the troubles faced by users related to email addresses or fraudulent and scam emails.